This is a great place for budget backpackers. 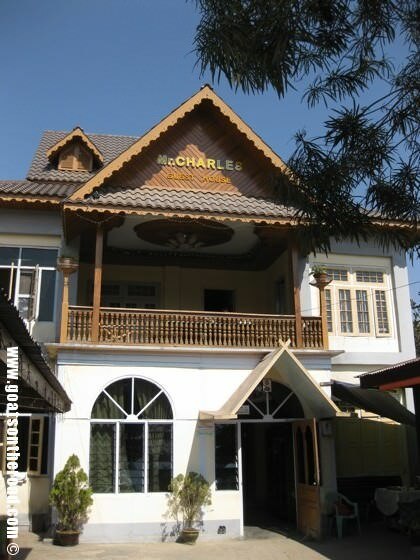 Mr. Charles Guesthouse has 2 areas for sleeping. 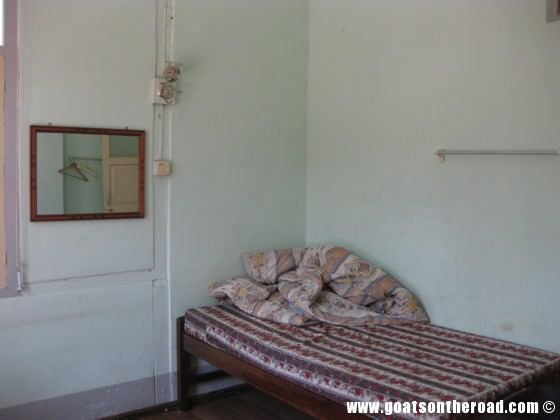 The older, not as nice wing has double rooms (with 2 beds) for $12 – $18USD. These rooms have very basic beds with pathetic mattresses and walls as thin as paper! However, the rooms come with breakfast and great shared bathrooms and showers with very hot water. The newer wing has much nicer rooms but they are also quite a bit more pricey – $30 for an a/c room with balcony. There’s no wi-fi, but that’s pretty standard in Myanmar and the staff are very helpful. There’s a really nice communal balcony in the older building where you’ll find like-minded backpackers hanging out exchanging travel stories. Bikes are available for rent, there’s hand drawn maps for free at reception and there are tour guides ready to take you on a trek. Pros: good price, clean room, breakfast is included, hot water shower, lots of information for backpackers and helpful reception, good location. Cons: thin mattresses and walls, no wi-fi.